I think we have a budding Road Trip aficionado on our hands. Obviously we had our doubts about a long road trip; would it be too much for Gerry (and his back) to stand? Would the kids fight? Which one would be left standing at the end of the trip? Would we be caught in Superstorm Draco? We left Saint Paul on Friday morning, about 2 hours later than I wanted. Note to self: Yelling up at the kids, “Are you up?” is NOT good enough. Cold water must be employed if we want to leave before 6am. I had each family member pack a suitcase of their stuff, then we had a spare suitcase where we kept clothing for 3 days, toiletries and medicines. The long-term suitcases went on top of the car in a Rubbermaid roof carrier, the other suitcase + a cooler + pillows & blankets + computer stuff + my knitting + a tent* went into the back of the car. We definitely took our time. In retrospect, we could have done it in 3 days (and we will on the way back) but doing a 6 hour day and a 7 hour day made for a much more enjoyable ride! The hardest part of the whole drive was going through Iowa. They got hit VERY hard with Draco, and pretty much 50 miles in from the MN border we ran into entirely packed ICE on the roads, slow going and lots of backups. We sat at on point for over 1-1/2 hours. We also counted almost 60 cars spun out and in ditches along the road in Iowa alone. As I said, they got hit HARD. Kansas – Or Oklahoma? – Or Texas? Once through Missouri, we were in great shape road-wise. We stopped at a Motel 6 in Wichita, it wasn’t bad, but it was the TINIEST room I’ve ever had in the US. It felt like the cabin on a cruise ship! We were absolutely exhausted, though, so a clean bed was all that we wanted, and we got it! 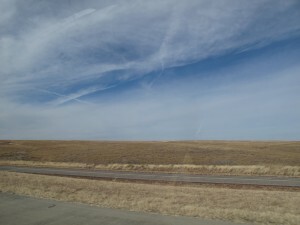 Driving through Kansas / Oklahoma / Texas was just – interminable. 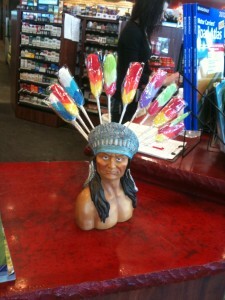 Apparently in Oklahoma for each successful hunt a brave was awarded – a lollipop? Oy. 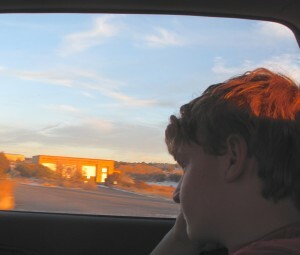 Nothing terribly interesting to see, just lots of driving and listening to Artemis Fowl books! The next night we stayed at the Lodge in Santa Fe, a priceline name-your-price deal. For $60 it was a great room, a very nice hotel, although it’s obvious that it’s getting a little ragged around the edges. Santa Fe was absolutely lovely, we had a great dinner and headed out the next morning for Sedona. The scenery we passed was extraordinary, but we were in NO way prepared for the beauty of Arizona (& New Mexico in general) Just spectacular. 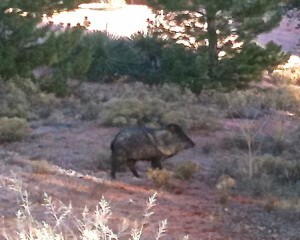 Once in Sedona we were intrigued by the Javalinos (a type of peccary) outside the house where we were staying. We even say a tiny baby Javalino! Going through Arizona was quite beautiful. 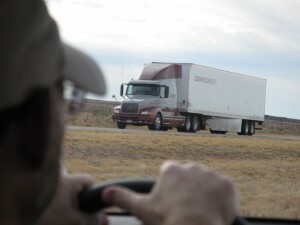 But I have to say outside of Dallas and Philadelphia, AZ drivers are the most aggressive I’ve ever experienced! The last driving day wasn’t long, but it took us down by the Mexico border (the hottest driving) and up the Kumiyaay Highway (the hardest and coldest driving outside of Iowa) and into Southern California and San Diego. And our final destination! We’re having a VERY low-key holiday, the first time we haven’t really ‘done’ Christmas, and I think we’ve all found it enjoyable and less stressful! The kids had small gifties this morning and we had a great home cooked breakfast this morning and Gerry and the kids took our canine charge, Rusty, out for a long walk. Later today we’ll take him to the beach and enjoy the California sunset. 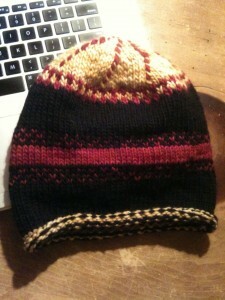 This entry was posted in Travel and tagged La Jolla, road-trip by Annie. Bookmark the permalink. I’m not judging you on the tent — it was an excellent preparation. You still have to get back home you know but I’ll be hoping you don’t need it. Merry Christmas to your family. Enjoy the stay in the warmth! Annie, your trip is bringing back wonderful memories. In 1972 my husband and I traveled from San Diego to NYC in a station wagon with 5 children and a dog. On top of the car in a luggage pod was all our camping gear. 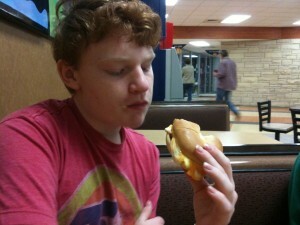 At each stop we put up the tent, pumped up the air bags, and cooked Hamburger Help. Best family time ever. I was in Santa Fe a couple of years ago and was amazed at the natural beauty too. It was the first time I swam in a salt water pool and we had amazing meals that were so good. It’s great your kids are loving the road. OT I love HOTN. It is an amazing work of art. 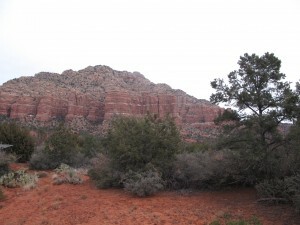 I adored Santa Fe and Sedona! So different from New Jersey in regards to landscape. Just stunning. I agree though, Arizona drivers blew my mind. Quite a few go through red lights so be careful.